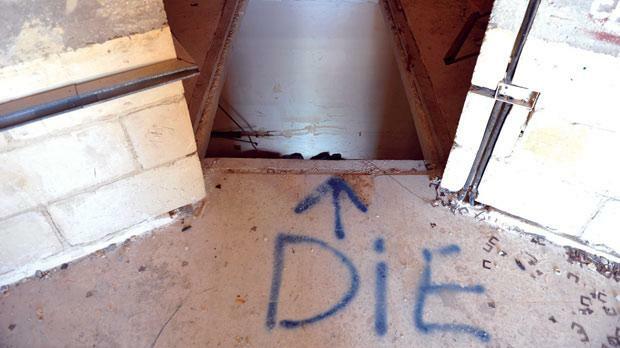 A pertinent message scrawled on the floor near a shaft entrance. South Malta’s former biggest hotel has been reduced to a dangerous shell, with parts of the publicly accessible structure collapsing due to weather damage. 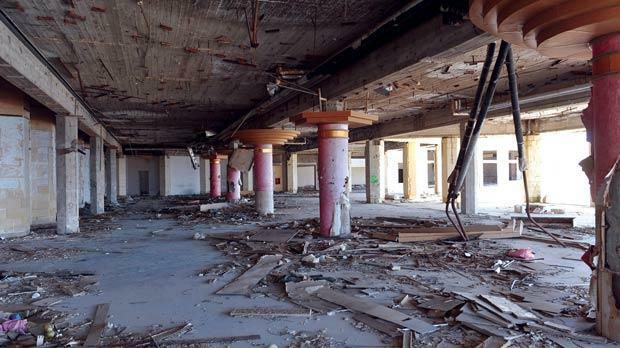 The four-star Jerma Palace hotel, once owned by a Libyan state company and leased and operated by the Corinthia Group, closed down in March 2007 after opening in 1982 and has since been stripped bare. It is now owned by contractors Jeffrey and Peter Montebello, who landed a succession of large projects, from A3 towers near the Addolorata Cemetery in Paola, to the Belmonte Heights apartment block in Sliema and the Xemxija Heights project. Questions sent to the Montebellos on Thursday have not been answered. Jerma Palace’s remains have been ransacked, and items stolen, including the blue tiles from the round outdoor pool, carpets, soffit ceilings, marble floors, bathroom fixtures, doors and even limestone bricks from the walls. Broken glass and mirrors lie strewn across every surface and stray cats have moved into rooms that once boasted some of the island’s finest sea views. Walking through the dilapidated site, Times of Malta saw open lift shafts, open staircases and free access to the roof with no protection from a six-storey fall. Rooftop rooms have partially collapsed and other areas are in serious danger of following suit. Children were seen playing among the graffiti-decorated ruins before dashing out. When asked about dilapidated and abandoned sites, Malta Developers Association president Sandro Chetcuti said the law did not cover abandoned buildings. Developers were legally bound to construct a wall around building sites but abandoned properties are not catered for, and the MDA is working on a proposal to present to the government, he said. The association wanted better construction results and designs and is working towards feasible policies on retro-fitting old buildings, Mr Chetcuti added.